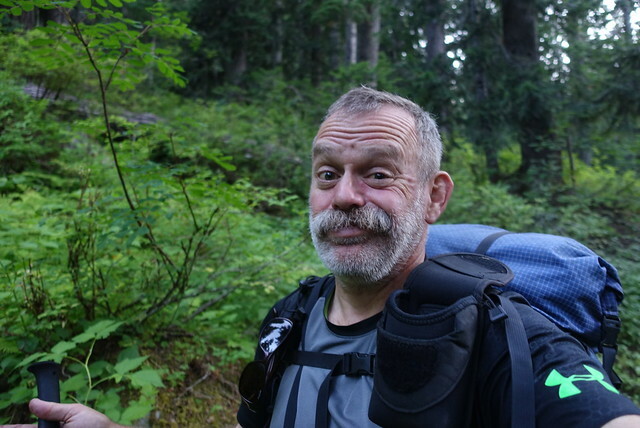 Just a note: for the next (and last) 200 miles of the PCT through northern Washington there isn't much cell phone coverage, so I can't update this blog. I expect to be able to catch up around August 14th. Until then, happy trails! Well, today didn't go as planned, and that previous post was obsolete pretty quickly. Conditions were changing pretty quickly, and by thinking it through later in the day, I ended up avoiding a potentially difficult situation with the wildfires to the north. I was pretty lazy in the morning, though I did walk over to the Skykomish Post Office at 8am to pick up my resupply package--six days of food for the 100 miles to Stehekin (five hiking days plus an extra day for unexpected delays). I wondered if I'd need that extra food, it's a couple of extra pounds, and I decided it was worth taking. I came back to the Cascadia Inn and chowed down on a Train Wreck Scramble, then went up to the room to do the final packing, putting the food into its OPsack, but not before taking a picture of what food I'm taking this week. 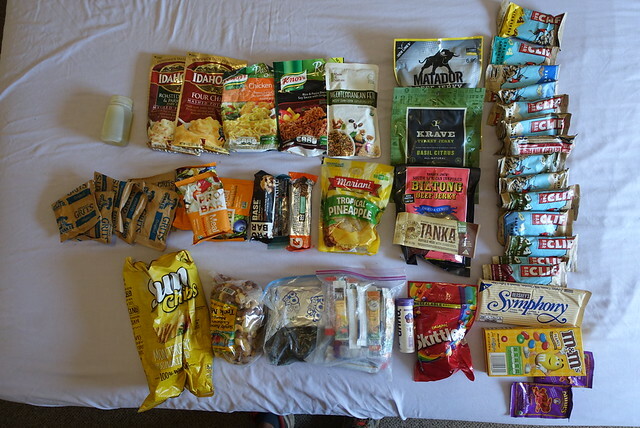 Gotta remember this for any future trips--nothing particularly 'backpackery' about this food at all, though I didn't put in the chopped dates, which I loved snacking on in the last PCT section. I had four days of blog entries to polish off, and I was thinking it'd be better to hitch up to Stevens Pass and get a little lunch while I finished them all up. There's much better cell service than in my room at the inn, and I could even enjoy a beer too. So I wandered over to the Sky Deli on Highway 2 to hitch--and ran into Bipolar and Lyle again. Lyle's family had come up to meet him, and they were all gathered around a picnic table. 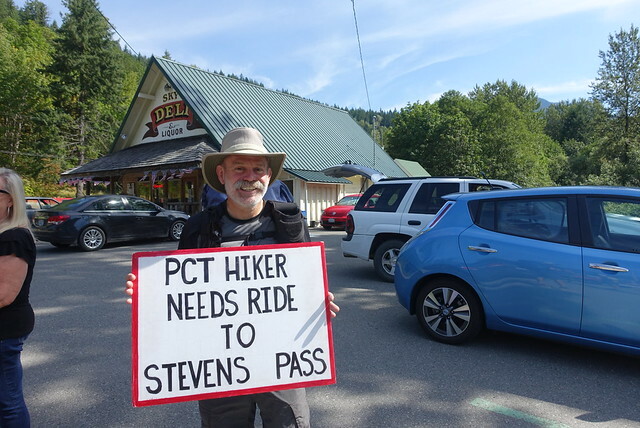 We enjoyed a chat for awhile; I went into the deli and grabbed a Sprite and Sunchips, and the deli cashier said "PCT hiker? Take this sign to help you hitch! Just return it at the espresso drive through window when you've got the ride" Yeah! Awesome sign, and it helped me and Bipolar get a hitch in about ten minutes. Captain Mike and his wife Lori gave us a ride up in his Subaru, he did the PCT in 2004 or so, and was more than happy to help us get back to the pass. Thanks Captain Mike. Thanks Sky Deli for the sign! Worked great! I scouted out a table upstairs at the Stevens Pass Lodge, ordered a teriyaki salmon burger (very Northwest), and settled in next to a power outlet for a bit of blogging. I wasn't too particularly worried about the time--my plan was to head to Janus Lake, 9 miles in, and that's only 4 hours really at most. So I had until 3 to get across the highway, plenty of time to upload pictures and sprinkle them through the (mostly) already written blog entries. About 1pm, though, a huge fluffy plume of gray smoke appeared on the horizon; the bartender (trailname Milestone, PCT 2014) pointed it out. Uh oh. What does Inciweb show? (at http://inciweb.nwcg.gov/incident/4354/) It's the Wolverine Fire, now at 400 acres, and they're evacuating the 300 people out of Holden village down to Lake Chelan. 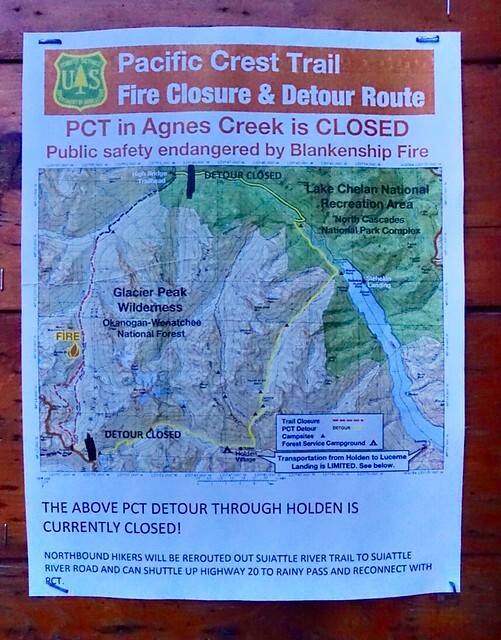 Uh oh--and the PCT detour around the Blankenship fire is now closed. Hm. This is interesting, but there'll be another way around the fire I'm sure. The plume went away after a bit, but it still looked mighty smoky to the north. I looked at Google Maps on my phone--when you zoom in you can see the PCT--and saw there were a few bailout spots to the west, so I figured I'd make some miles until I couldn't go any further. At 3 I walked across the overpass to the trailhead, and found a Forest Service Ranger there, and Bipolar too. Hmmmm. Ranger said "You know about the closure?" Yep, I do. "You know the detour's closed too?" Yep, I'll bail out west. Ranger guy said "You could go out at Suiattle River to the west, and then skip to Rainy Pass on Highway 20, but it might be easier to just go down to Leavenworth and Wenatchee and take the ferry up Lake Chelan to Stehekin." I thought that sounded like a bit too much, plus I'd be skipping yet another huge chunk. Better to make the miles now until I was forced off. I can always find a hitch. So I started walking north on the PCT along a very level path, then a moderate uphill toward Lake Valhalla and then Lake Janus... and reconsidering my plans. Should I do this? It's five to six days to the detour at Suiattle River. Things might change a lot by then. The weather is hot and will continue to be very warm with possible thunderstorms later in the week, which means lightning too. It's been very dry the past few months, and there's little to no cell service in the days ahead, so it'll be hard to figure out what's going on. I have some extra food, but what if the fire spreads west? Will I have to backtrack a lot? What can I do? Turn around? Go east? Go west? Drive some 15 to 20 miles down a dirt forest road to the paved highway. That's a lot of hitching, 100 miles roughly in three parts. About 50 miles of PCT will be bypassed. The other option was take the ferry to Stehekin and continue north. About 107 miles of PCT will be bypassed. Hm. I walked further and found a tenuous bar of cell service and investigated. No hitching involved--I could get a bus. I thought a good idea would be to maybe find my way to Seattle then take a bus to Wenatchee and the public transit bus to Chelan and the ferry. That's a good option! I left a message my cousin-in-law Brian, who offered his help awhile back... and updated the Facebook so family wouldn't worry. Here's that post. More fire closures to the north of Glacier Peak. There isn't a way to walk on the PCT to Stehekin; the detour has been closed. [The Suiattle River trail](http://www.wta.org/go-hiking/hikes/suiattle-river-trail/) is my bailout to the west to Darrington and the mountain loop, and from there to Highway 20 to rejoin the PCT. That's doable. In the east, there's a bus from Seattle to Chelan via Leavenworth (and public transit between Leavenworth/Wenatchee/Chelan as well on Link Transit) and I could take the ferry to Stehekin to rejoin the PCT. I'd really like to see Stehekin, it's difficult to get to... So I'm thinking this is the most scenic and interesting option. Tonight, though, I'm camping at Lake Valhalla just north of Stevens Pass. Tomorrow, though, I think it'll be time to head into Seattle and regroup. But a few minutes after I posted I got a nice three bars of service, and almost immediately after that Brian called, and said "I can come get you in a couple of hours!" Oh yes, that would be great. I turned around and headed back to Stevens Pass at dusk. 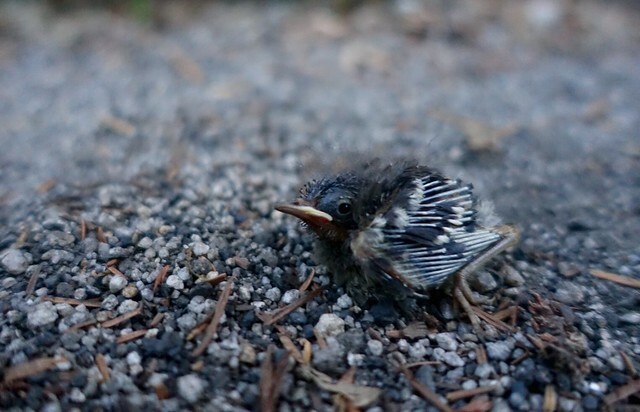 It was a pretty walk, I saw pikas and a small newly hatched chick that was in the middle of the PCT (how did it get there? ), and ran into Bipolar again heading north. I said "I'm doing the ferry" and we wished each other well. I made it back to the trailhead right as it was getting too dark to walk without a headlamp, around 9:15. I took my one scenery picture for the day as well... and noticed a new closure notice at the trailhead info board. I sat down to wait for Brian--but not more than a minute after plopping down on the parking lot steps Brian showed up. Man, I was thankful to see him... we drove down to Seattle in the twilight, I crashed at their house (thanks Brian and Carrie and Ben and Erik!) and have a few days to figure out the remaining time on the trail. My PCT journey is turning into a real mishmash. I've got a couple of weeks left now, just under 100 miles, that's easy to knock off. More than a little bit is looking forward to being off the trail, and not having to deal every day with unpredictable fires or unexpected weather. Some boring routine would actually be appreciated.